If you are looking for a grain-free alternative to rice, you need to try this yellow rice – aka turmeric cauliflower “rice.” If you have a food processor, you can have this on the table in less than 10 minutes. While my family was doing Whole30 this month, I had to get creative with my side dishes. I didn’t realize how much rice we ate until we couldn’t have it for a month! 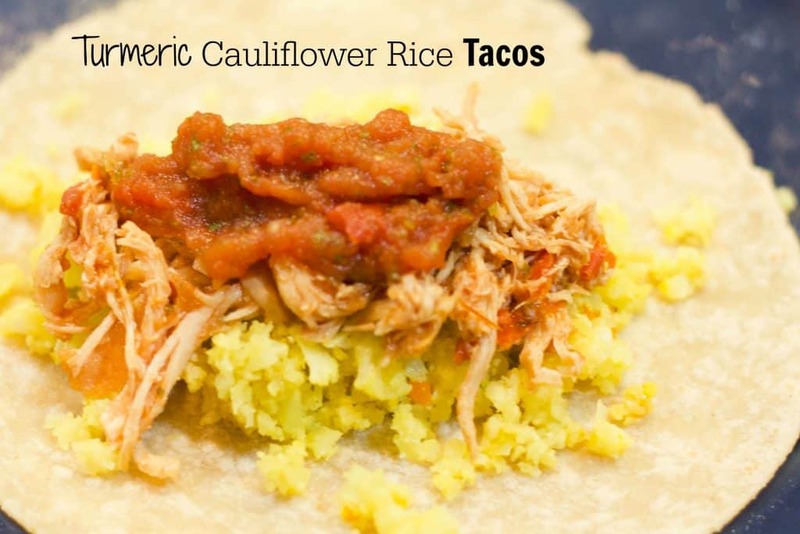 This grain-free yellow rice alternative was so good, we even had this turmeric cauliflower rice in our Taco Tuesday tacos and my little guy thought I was lying to him when I told him it was cauliflower. To make this rice yellow, you just add turmeric. Turmeric is such a power ingredient! Turmeric is one of the most researched spices and is heralded as one of the most beneficial natural ingredients alongside my other kitchen faves – garlic and ginger. This recipe contains turmeric AND garlic. Don’t you feel better already? Turmeric has been shown to have anti-inflammatory and anti-depressant properties as well as beneficial for people who suffer from inflammatory bowel disease. 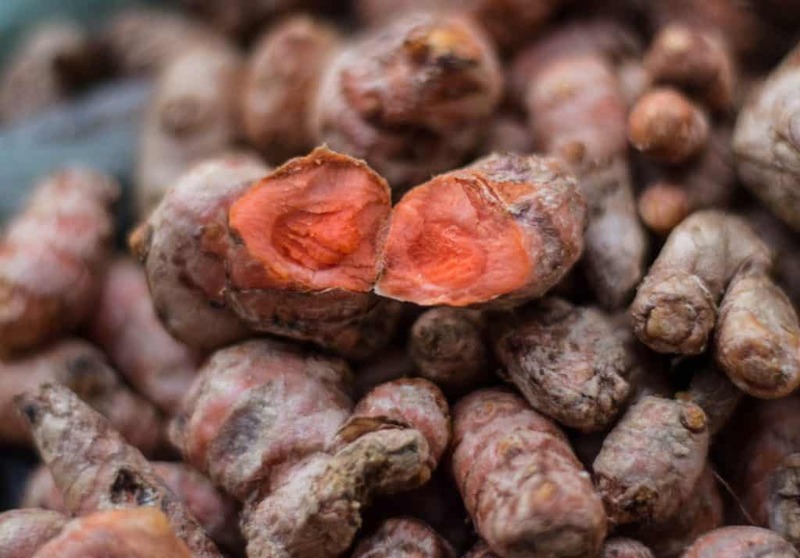 If you can’t find turmeric root at your local grocery store or farmer’s market, you might need to check out a health food store or a Whole Foods. We have had this yellow cauliflower rice three times this week. If you don’t want it yellow, just leave out the turmeric! If you don’t have turmeric root, use turmeric powder. Easy peasy. Enjoy!! 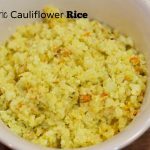 Turmeric Cauliflower Rice – 10 Minutes to Dinner! Cauliflower, garlic, and turmeric will make the most amazing yellow cauliflower "rice" - you won't even miss the real thing! Roughly chop your head of cauliflower into large chunks. Use all the white parts. Add batches of cauliflower into your food processor. Don't overfill your food processor - you probably want to process the cauliflower in 2 to 3 batches. Roughly peel turmeric root. Add to food processor. Crush the garlic cloves with salt. Saute in olive oil until they start to get crispy. Add the cauliflower, Stir. Add a little bit more olive oil and maybe some salt. Add the minced turmeric to the cauliflower. Stir again until the cauliflower turns yellow. 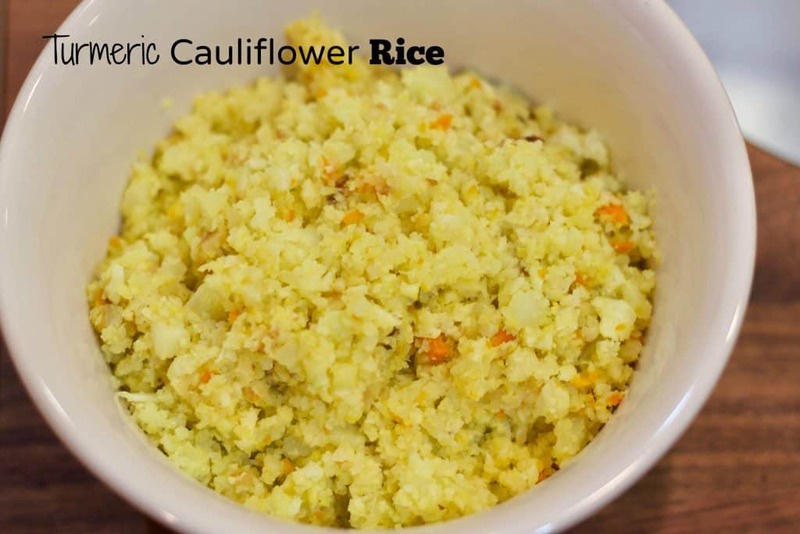 I’ve been looking for more ways to use turmeric and this cauliflower rice looks perfect! Can’t wait to try it! Hi Erin – one of my pulmonologist friends recently told me that she and all her dr. friends put all their chemo patients on turmeric for its amazing immune building properties. I’ve been taking it in pill form and eating it whenever I can ever since she told me. This is another great way to incorporate it into our diet. YUM!!! That’s awesome to hear that, Allie!! I LOVE turmeric. I love it when I hear that allopathic medicine is seeing benefits as well. Yummy! Thanks for sharing these great recipes! Thank you, Amanda! I’ve got to get you some delicious recipes using the awesome Pop Up Produce herbs and greens!